The NYPD released surveillance photos of other boys suspected of setting fire to a school bus. 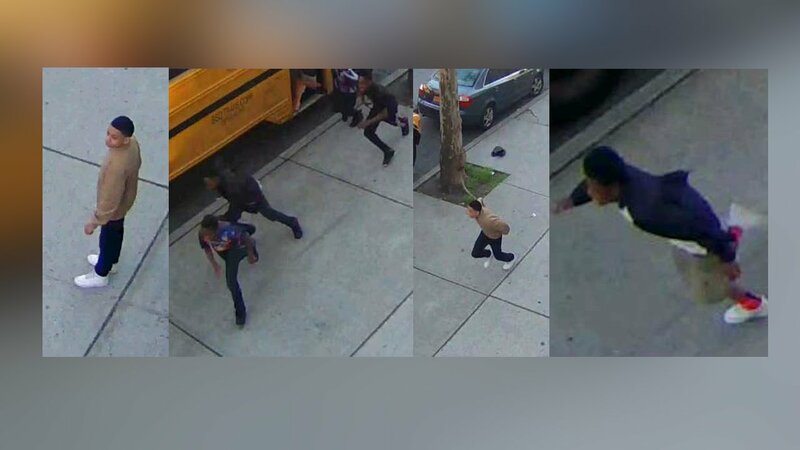 CROWN HEIGHTS, Brooklyn (WABC) -- Police in Brooklyn are looking for the boys who helped an 11-year-old who is accused of setting fire to a school bus outside a Jewish school in Crown Heights. The 11-year-old is charged with arson and mischief as a hate crime. Surveillance images show a group of boys torching the bus after they loaded it up with cardboard for kindling. The boy admits he was on the bus but denies setting the fire, according to investigators, but is refusing to help detectives identify the other boys. The NYPD also released surveillance video from the scene of the fire. The NYPD released surveillance video from the school bus fire in Crown Heights. As many as five boys were on the parked bus when the boy lit the fire just after 6 p.m. Sunday night outside a Jewish elementary school on Lefferts Avenue in the Crown Heights section, police say. The school bus, privately owned, went up like an inferno, as seen in security video obtained by Eyewitness News. Crime scene investigators worked the charred shell of the bus for evidence. On the ground were items from the inside including cell phones and religious books. The fire took an hour to get under control. No one was injured. The 11-year-old suspect was charged as a juvenile and released to his parents. Detectives are also trying to determine whether some or all members of this group are involved in two other attacks. Rocks were thrown at a bus operated by an Orthodox Jewish school on Eastern Parkway, between Albany and Kingston Avenues at around 2:20 p.m. last Thursday afternoon. The rocks damaged a driver's side mirror. The bus driver saw at least one teen flee the scene. And a 37-year-old Orthodox Jewish man was punched by a boy who threw a pole at him and flicked rubber bands at him while walking on Eastern Parkway at around 2:20 p.m. Friday afternoon. The man detained the boy until police arrived, but other youths may be involved.